How much is 100 tonnes? What I mean is, 100,000 kilogrammes – just how big would a pile weighing that much be? How much floor space would it take up? How wide or tall? How heavy really is 100 tonnes, not just in the mind’s understanding of what‘s “heavy!”, but if you tried to move 100 tonnes without mechanical help, what would happen? I reckon nothing the eye could see, yet so many things that could go “snap” or “crack” inside you all at once. An Orca – the whale in the movie Free Willy – which is actually the largest member of the dolphin family rather than a whale, grows to about nine meters long and weighs six to seven tonnes. Which means it’d take 14 to 15 Orcas to just about make 100 tonnes. Or a Humpback whale, which is a true whale. At about 16 meters long and weighing 36 tonnes, it’d take less than three Humpbacks to make 100 tonnes. Still, if you’ve watched a nature documentary and seen a Humpback breach, you’ll appreciate how much whale that is by the enormous splash they make on re-entry. So, “less than” is misleading here. I’ve had the profound pleasure of seeing Humpbacks breach “live” while on the Inside Passage cruise from Vancouver to Alaska in 2009 – they’re truly amazing, magnificent creatures to observe in nature. And they’re huge! The largest land animal, a male African elephant, stands at a height of four meters and weighs about seven tonnes. It’s similar to an Orca weight-wise, so we’d also need about 14 of these elephants to get our 100 tonnes. The reason I’m going on about 100 tonnes is because that’s the amount of rock melon we’ll be supplying a client’s cruise ships as part of a contract this season. There’re many other items in that contract, but 100 tonnes of rock melons tend to stand out. At between one-and-a-half to two kilogrammes each, that’s 50,000 to 65,000 fruit! Plus, I like rock melons; they’re a sweet, refreshing fruit that can be enjoyed anytime. Rock melons are rich in vitamins A and C, and potassium. Vitamin A benefits us in multiple ways: it’s important for human growth and development, and for the maintenance of our immune system. It’s also important for good vision, in particular low-light and colour vision. Vitamin C is an essential nutrient for humans. It’s required for the synthesis of collagen in our bodies, which is important for healthy tendons, ligaments, skin, and effective wound healing. Vitamin C is also important in preventing diseases like scurvy, which brings up an interesting bit of maritime history. Scurvy was a common disease that plagued sailors who had to be at sea longer than perishable fruits and vegetables could be stored. This was of course a long time ago, before the age of freezers and chiller rooms. Sailors depended on cured and salted meats, dried grains and provisions, and lots of ale to keep going. Back then, scurvy was seriously scary stuff. The disease not only limited maritime travel, there was also a very real risk that ships’ crew and passengers undertaking long sea voyages could, and often did, die from it. It was only from the 1930s that a consistent treatment for scurvy which involved consuming fresh food, especially vitamin C-rich fruits, was implemented. Humans aren’t able to synthesise our own vitamin C, so we must obtain adequate amounts of it from our diet – eating lots of vegetables and fruits (thank goodness rock melons are so yummy!). Potassium is another nutrient that rock melons are rich in. Potassium is important for the healthy and proper functioning of all living cells in our body. In particular, it’s necessary for potassium ions to shift across nerve cell membranes to enable normal nerve transmissions. It’s vital that we maintain an adequate amount of potassium in us to avoid long-term risks of developing various electrocardiographic (ECG) abnormalities, such as an abnormal heart rhythm. Rock melons are most commonly eaten as a fresh fruit. Chilled and served in slices or cubes, they’re really hard to beat for a refreshing burst of juicy sweetness. They are also easily used in salads, as a dessert (with a big scoop of your favourite ice cream, yums! ), and juiced on their own or mixed with other fruits. And, one of my favourite antipasto, rock melons are really delicious when wrapped in prosciutto – that blend of finely sliced, savoury, dry-cured-ham saltiness with the fresh, crisp, fruity sweetness from the piece of rock melon is just heavenly. The popularity of rock melons is also in choosing their ripeness. Looking at the skin of a rock melon, when it’s green in colour between the veins, the fruit is unripe. If it’s golden all over, it’s very ripe, very sweet, and the flesh will be soft. At this stage the fruit should be eaten within a day or two. If you prefer the flesh to be crisp, then you’ll want to choose rock melons which are green between the veins with patches of golden colour. So it seems this popular fruit does offer something for everyone. And if you like to use your nose to sniff out the best fruit, rock melons that are ripe have a lovely, fragrant aroma. One last thing before I sign off, if you’re from America, Canada or India, you may not be familiar with rock melons. That’s because you’ll know them as cantaloupes. Around here, and over in Australia and New Zealand, we call them rock melons. Well, you say poh-tay-toh, and I say poh-tah-toh; you say toh-may-toh, and I say toh-mah-toh… as that song suggests, shall we then call the whole thing off? But in that classic “Let’s Call The Whole Thing Off” song-and-dance scene from the movie Shall We Dance, Fred Astaire and Ginger Rogers certainly didn’t call it off. Instead they danced on gloriously, and we should too. As a matter of fact, we should Rock – Rock Melon, that is! The Chinese name for cantaloupe is’哈蜜瓜’ – ‘哈’ (haa – laughing), ‘蜜’ (matt – honey, sweet) and ’瓜’ (gwaa1 – gourd, melon). 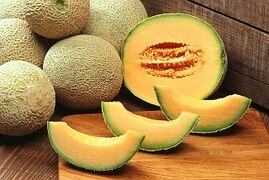 Cantaloupes (muskmelon) are native to Persia, the present-day Iran. The oldest pictorial record of muskmelon appears to be in an Egyptian illustration dating back to 2400 B.C. Historical records give indications that the Greeks grew muskmelon back in 300 B.C. Cultivation of muskmelon spread slowly westward and by the late 15th century, Christopher Columbus carried muskmelon seeds with him on one of his voyages to the New World. Legend has it that muskmelons, the forbidden fruit, brought to the Middle Kingdom by Persian traders on the Silk Road can only be eaten by the Emperor in China and the Empress Dowager Cixi was reputed to put to death anyone eating muskmelon. So much for the origin and legend of the cantaloupe. For Sofresh to secure a contract for the provision of a 100 tonnes of rock melon for the enjoyment of the passengers of a cruise ship stands accolade to the singular achievements of the man who made it all possible, your Dad. Well written Ben, keep up the good work. Hi Uncle Eddie – Yup, and he’s still hard at work everyday! Interesting history on the rock melon, much thanks for your comments, cheers!